← A Norwegian coastal cruise (Part 2) and some thoughts on photographing the Northern Lights. Help! Am a turning into a twitcher? Earlier this week I headed down to Kidwelly near Carmarthen. Having arrived there I checked the Pembs Bird Blog – as I regularly do – to find that a green heron had been found near Narberth, only about 25 miles away. This is an exceptionally rare vagrant from north and central America to the British Isles, and a visit was a no-brainer, really. I restrained myself for several hours the following morning, photographing migrating whimbrel which had been pushed high on to the saltmarsh by a spring tide. But after a second breakfast I headed over to Pembrokeshire. Full directions to the site were given on the Bird Blog; it was in the grounds of the local M.P.’s house who very generously, really, had opened up his garden to the possibly hundreds of complete strangers who might want to see the bird. I arrived mid-morning to find maybe twenty birders already there, with many thousands of pounds worth of optical and photographic gear on display, camped out just outside the back door of the house. The heron was in a wildlife pond, created by the owner, nearby, but unfortunately not showing very well. The words “creep”, “lurk” and “virtually invisible” come to mind. At mid-day it came to the edge of a bullrush bed and preened for a while, and a motor-drive hammered away over my right shoulder. That guy would have hundreds of virtually identical and more-or-less unusable files to sort through and delete! The heron retreated again, and I decided to cut my losses and return the next morning, when I guessed it might be more active. I arrived about 7 a.m. to find the bird roosting close to the garden, but low down in deep shade. It immediately flew a little further away onto a low, horizontal branch where it remained for some time, facing away and partially shielded by branches and twigs. It eventually came closer and sidled up a branch in full view, where I was able to photograph it successfully. The above image is a big crop, from near the edge of the frame, and I continue to be amazed at the quality of results possible from the rather modest Tamron 150-600 Mk 1 lens that I have had for more than four years now. It helps to have a Canon 5d on the end of it, of course, but even that is only a mk3. I have cleaned up a couple twigs from behind and around the bird. From the branch the heron extended its very long neck and stretched down to pick up some prey from the water beneath. As it did so it nearly slipped off the branch, exposing it’s stunning plumage, which shimmered with irridescent colours in the sunlight. You can see this quite well in the smaller image. 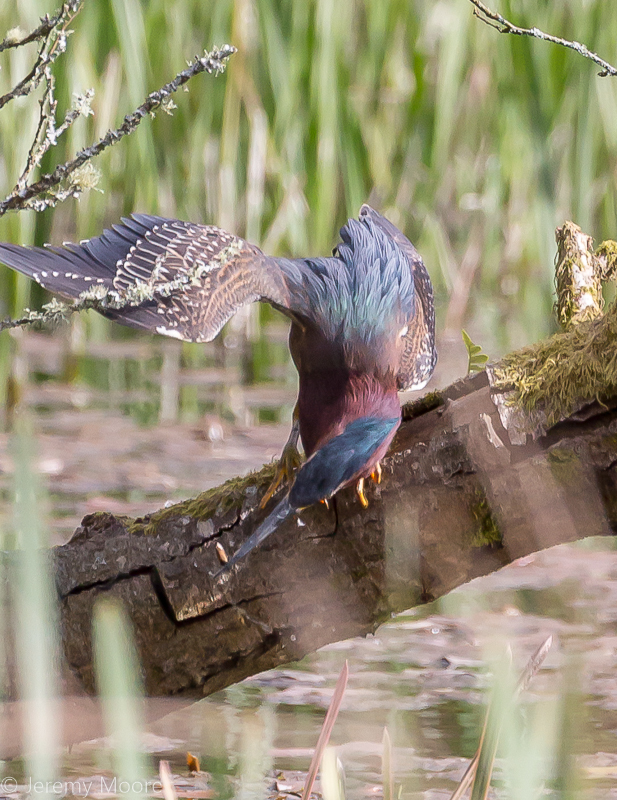 The name green heron really doesn’t do it justice. One has to wonder how it managed to cross the Atlantic and arrive in such an obscure part of south Wales, some five miles from the coast. Some say it may have been “ship-assisted”, and it may have been lurking unseen around the area for months. We will probably never know, but it certainly seems to have found some ideal habitat with plenty of food to keep it going for some time. Everyone who has seen the green heron will be very grateful for the opportunity. Birders from all over the UK were arriving at all hours of the day (and probably night). One car-load had set off from Tees-side at 11 pm and arrived at 5 am, others had come from Woking and Nottingham to name but two. One can only applaud the hospitality of Simon Hart and his wife, who at least once a day brought out a tray of mugs complete with a pot of delicious freshly brewed coffee. I couldn’t help noticing the “Countryside Alliance” sticker on the kitchen window. However these are no ordinary members; Mr Hart was its Chief Executive from 2003 until 2010, and is currently its Chairman. The Countryside Alliance is a major part of the pro-hunting lobby and gets a pretty bad press amongst conservationists. As is common at twitches (apparently) a donations bucket was left outside – with donations in this case going to the charity “Songbird Survival”. This latter organisation also has a bad reputation amonst many wildlife lovers, being seen as a front for predator control (although there is nothing controversial on their website). One could not help but notice, though, that its staff and trustees are gathered largely from the land-owning fraternity, with no representatives at all from any of the main (or even minor) conservation organisations, which seems rather curious. But having seen the amount of fabulous wildlife habitat Mr Hart has created around his home one should perhaps take a more open-minded view of the way the landed types go about things. So am I turning into a twitcher? On this particular trip I managed to get decent images from the Kidwelly area which may see the light of day some time next year. 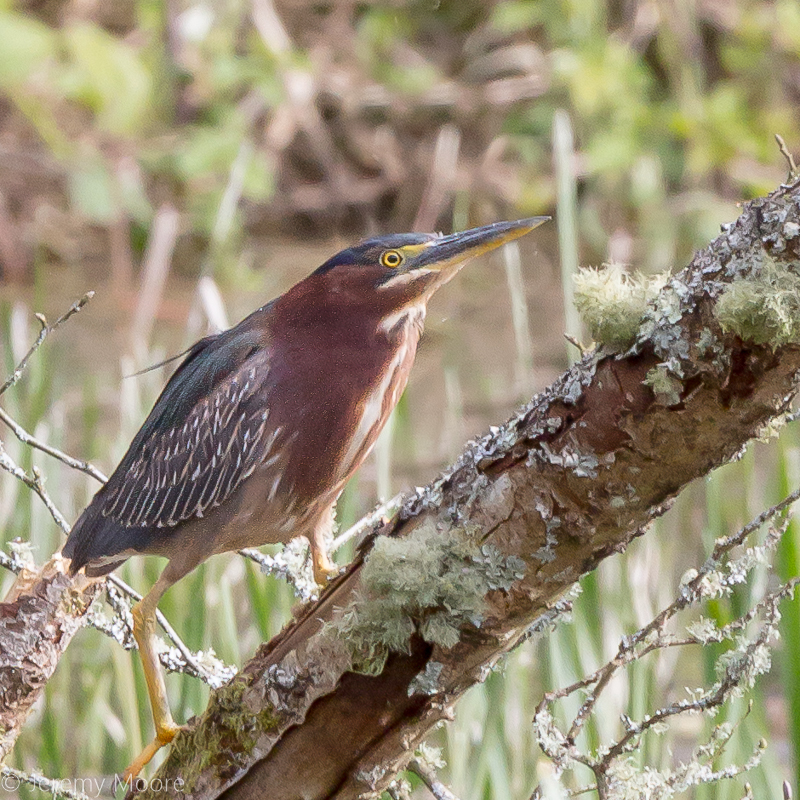 Seeing the green heron was a bonus at the cost of modest additional mileage. Like most birders I’m sometimes tempted to add a new species to my list – (not that I have a list, he added hastily) – by travelling to see a rarity. I’ve sometimes described myself as “the world’s worst twitcher” due to past failures so two successes in recent weeks makes a nice change! But there’s no way I’m going to subscribe to one of the bird news services with the consequent anxiety and carbon emissions this would entail. That way madness lies. To follow Tales from Wild Wales, scroll down to the bottom and click Follow. This entry was posted in Uncategorized and tagged alliance, bird, birdwatching, countryside, green, heron, photography, twitching. Bookmark the permalink. 1 Response to Help! Am a turning into a twitcher? Great pics, what a rare day!